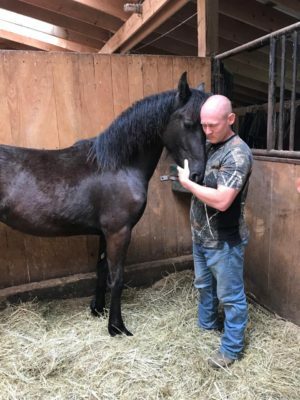 The Blue Lives Saving Horses and Helping Children program rescues horses from slaughter. The horses will then be rehabilitated and retrained for use in children’s equine therapy programs, our Abused Women’s Program or for adoption. Working with horses is an enjoyable and potent stress reliever. With this in mind, the program will focus on recruiting participants from the law enforcement community in an effort provide a healthy, enjoyable and productive method of relieving job related stress while saving horses and helping children. Catch and halter a loose equine with minimal assistance. Identify signs of relaxation and agitation. Identify different types of tack, their parts and usages. Maintaining control at the walk, trot, and canter (as horse is able) and halt. Beginning to understand and execute basic schooling figures (circles, figure-8, serpentines) at various gaits. Program costs for Blue Lives Saving Horses Helping Children are free to accepted applicants. The program is run in 10 week sessions. Lesson times are determined individually. If you are interested in joining this program or would like to volunteer to help, contact us at HHHdressage@gmail.com or call us at 740-694-5150.